Best Potatoes for Soup – Which Spud? Wondering what are the best potatoes for soup? If you are not sure which spud to choose for your next hearty soup or stew then read on. Different potatoes bring different things to a soup. it can be flavor, starchiness or consistency. Though recipes are heavily disputed, consider the popular Colombian dish, ajiaco, which is a chicken and potato-based soup that typically incorporates three different kinds of potatoes, all of which serve a different purpose. Some of them break down and some of them hold their shape; the outcome of your dish will be dependent on the potato type as well. When choosing the best potatoes for soup, it’s important to know what your end game is. What is your desired consistency? Do you want the potatoes to retain their shape? Once you decide what you are looking for, you can choose from one of the three different types of potatoes. Essentially potatoes with low starch levels, waxy potatoes are poorly absorbent, making them an excellent choice if you want your potatoes to retain their shape after being boiled or tossed into any liquid. Under this category fall several different kinds of potatoes. Red potatoes are small, round, and firm and are notoriously used for soups, stews, and potato salads. Even after being skinned, cut, and boiled, they manage to hold their shape well. New potatoes are essentially any potato that has been harvested early, meaning that most of these are small and round as well. This also means that they are fairly firm and ready to be boiled. Whether blue or red, Adirondack potatoes are very low in starch, which means that they will retain their shape. While some people use them for soups, they may not be the best choice as the blue especially may change the color. Starchy potatoes are the opposite and while they are great for boiling, they can break down easily, which is why you typically use these for mashed potato dishes. Starchy potatoes in soups typically don’t hold their shape. For soups, Idaho potatoes aren’t the best. They are very absorbent and will fall apart in a soup. 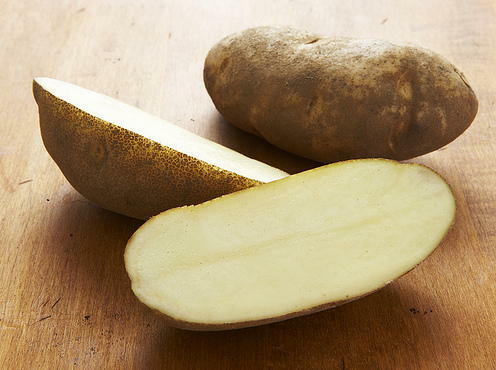 This is another starchy potato that shouldn’t be used for any dish that demands that the potato hold its shape. All-purpose potatoes, as they are called by some, fall somewhere in between starchy and waxy, which also means that they can sway more to either side depending on how they are handled.All-purpose potatoes can actually be excellent for soups. Yukon Gold potatoes, another small, soft, and yellow potato, are commonly used for soups. The ajiaco dish uses a similar style of potato. Yukon Golds will essentially disintegrate if cooked for too long. While that does create an excellently thick soup, it may not be what you are after. These should work in any dish as well. As with Yukon Gold, just be careful how you cook them. While they can retain their shape, they can quickly fall apart if cooked for too long. The potato you use will usually determine the outcome of your soup, so choose wisely. Other potatoes, such as the Inca gold and the fingerling, while waxy, aren’t commonly used in soups. « Harissa Substitute – What to Use ?